James Ryan was born at Stone, Staffordshire in late 1883, the eldest son of Galway-born labourer Patrick Ryan and his wife, Ann (nee Wade), who was born in the market town of Stone. The couple married in late 1867 and had six children. In 1891 Patrick Ryan, his wife and six children, including James, were living in Stone. In 1901, farm labourer James Ryan, born in Stone, Staffordshire, was serving time at His Majesty’s Prison in Stafford. By 1911, James Ryan, aged 29 and a single man, had moved to Ossett where he was working as a labourer and boarding at the Healey Road home of the Talbot family. It was here that he met Eliza Bilbrough, the daughter of carter, John Bilbrough who was living in a three-roomed house at nearby Gas Works Row with his wife, ten children and a lodger. In late 1911, James Ryan married Eliza Bilbrough in the Dewsbury area and the couple had two children: Albert Ryan, born in early 1912 and Thomas Ryan, born in early 1915. Both children were born in the Dewsbury area, most probably in Ossett. James Ryan’s army service record has not survived, but it is known that he enlisted at Wakefield and joined the 1st/4th Battalion of the King’s Own Yorkshire Light Infantry with service number 2450, which suggests he may have been in the Reserve or Territorials before August 1914. Private Ryan embarked for France on the 13th April 1915, and was killed in action on the 2nd September 1916. Private James James was posthumously awarded the British and Victory medals and also the 194/15 Star in recognition of his service overseas prior to the 31st December 1915. The 1/4th Battalion, Kings Own Yorkshire Light Infantry was a unit of the Territorial Force with HQ in Wakefield, serving with 3rd West Riding Brigade, West Riding Division. When war broke out in August 1914, the units of the Division had just departed for their annual summer camp, they were at once recalled to their home base and mobilised at once for war service, moving to Doncaster. In November they moved to Gainsborough and in February 1915 to York to prepare for service overseas, those men who had not volunteered for Imperial Service transferred to the newly formed 2/4th Battalion. They proceeded to France, from Folkestone landing at Boulogne on the 12th of April 1915 and the Division concentrated in the area around Estaires. On the 15th of May the formation was renamed 148th Brigade, 49th (West Riding) Division. Their first action was in the The Battle of Aubers Ridge in May 1915. In 1916 They were in action in the Battles of the Somme. In 1917 they were involved in the Operations on the Flanders Coast and the The Battle of Poelcapelle during the Third Battle of Ypres. In 1918 they were in action during the Battles of the Lys, The pursuit to the Selle and the Final Advance in Picardy. At the Armistice, The 49th Division was resting at Douai, demobilisation began in early 1919. "1st September 1916: Battalion in Aveluy Wood furnishing working parties digging parallels. Casualties 3 other ranks killed, 10 other ranks wounded." "2nd September 1916: W Company and Y Company remained in Aveluy Wood. X Company and Z Company and Battalion Headquarters moved to Martinsart Wood." It seems likely that Lance-corporal James Ryan was probably killed or wounded on the 1st September 1916 whilst his company were digging parallel trenches under enemy fire in Aveluy Wood. "Ossett Lance-Corporal Killed In Action - A True Soldier's Death - News was received yesterday that Lance-corporal J. Ryan of the K.O.Y.L.I., whose home was in Audsley's-yard, Healey-road, Ossett, was killed in action on Saturday last. The deceased soldier, who was 30 years of age leaves a wife and two little children. 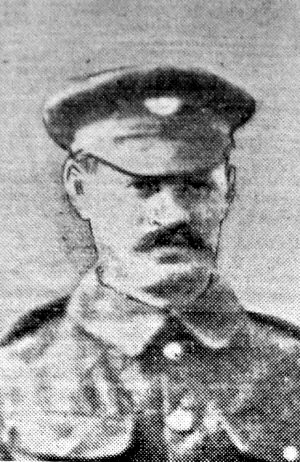 Prior to the war he worked at Horbury forge, and enlisted two years ago. He was one of the local men who were put out of action in the big gas attack last December, but returned to the front in April last after a short visit to his family. He had previously served in the army. The sad intelligence was conveyed to Mrs. Ryan, who had a postcard from her husband the previous day, stating that he was well. In a letter received from Lieut.-Colonel Haslegrave yesterday morning which was as follows: It is with extreme regret that I have to inform you that your husband, Lance-corporal J. Ryan, of the battalion under my command, was killed in action on the 2nd inst. Please accept my heartfelt sympathy with you in this your sad bereavement and great loss. There is some consolation, however, that your husband died a true soldier, fighting in a true and noble cause to uphold the honour and glory of the British Empire. This is a trying time for all of us, but we must bear our losses with a brave heart. He is buried in a military cemetery just behind the firing line, and the place is marked with a cross. I hope at some future date to be able to inform you of the exact spot where his body lies." 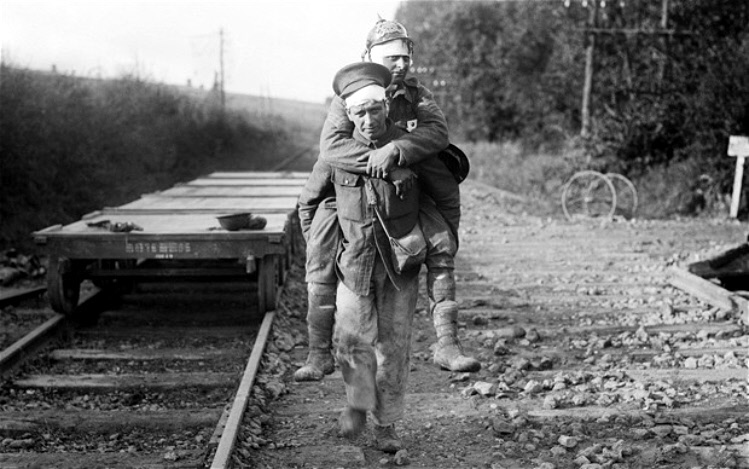 Above: A British soldier carries a wounded friend away from the front and to a dressing station near Aveluy Wood. Lance-Corporal James Ryan, aged 33 years, died on the 2nd September 1916. He is buried at grave reference IX. A. 7 at the Lonsdale Cemetery, Authuille, 2 Somme, France. Authuille is a village 5 kilometres north of the town of Albert on the D151 road to Grandcourt. On 1 July 1916, the first day of the Battle of the Somme, the 32nd Division, which included the 1st Dorsets and the 11th (Lonsdale) Battalion of the Border Regt attacked the German line at this point and stormed the Leipzig Salient, but were compelled to retire later in the day. In the spring of 1917, after the German withdrawal to the Hindenburg Line, V Corps cleared these battlefields and made a number of new cemeteries, including Lonsdale No.1 and No.2. Lonsdale Cemetery now contains 1,542 Commonwealth burials and commemorations of the First World War. 816 of the burials are unidentified but there are special memorials to 22 casualties known or believed to be buried among them.